How can IT deliver the ideal Windows 10 user experience? 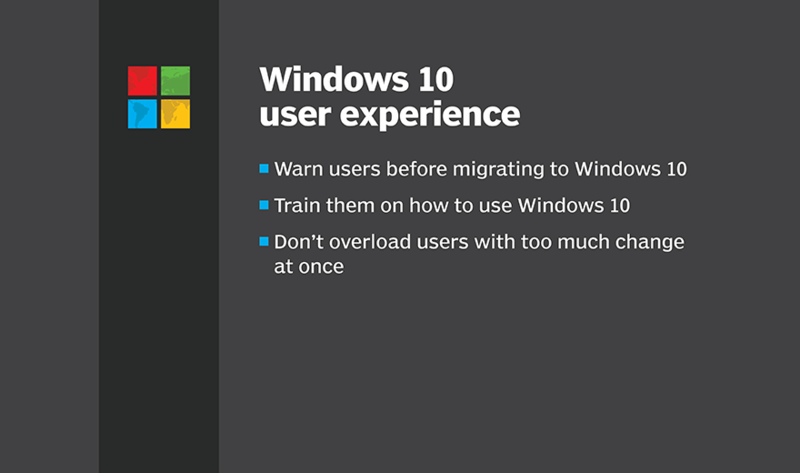 IT pros must keep users in mind when they decide to migrate to Windows 10. It's a bad idea to just spring the change on people. To get the Windows 10 user experience off on the right foot, it's only fair to give users a warning that the change is coming, and to offer users some training on the OS. There will inevitably be some nuances that users don't understand, so training should reduce the number of help desk calls after the migration. If IT pros cannot do the training themselves, they should point users to resources, such as YouTube tutorials. The OS change itself can be startling enough, so IT should wait to make any other major changes, such as upgrading applications. How can you make Windows 10 performance ideal for users?